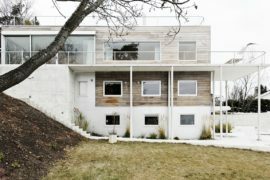 The Malbaie V Le Phare project is a 2,400 sq ft two-storey home located in the picturesque region of Cap-à-l’Aigle in the heart of Charlevoix, Quebec, Canada. 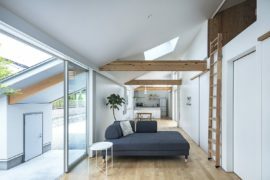 The house has been designed by Montreal-based Studio Mu Architecture. 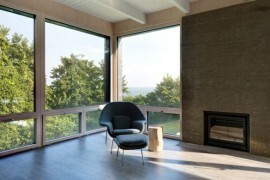 The residence is part of a unique residential hillside development that offers exhilarating views of La Malbaie, the St. Lawrence River and the surrounding mountains. 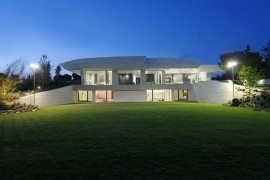 The design of the entire house is simple and in sync with the surrounding environment, yet sophisticated. The house is fully covered with a green roof that blends with the surrounding landscape and provides insulation from the heat during summer. 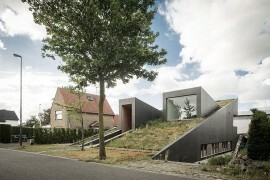 The exterior looks like simple geometric volumes embracing one another. A wide gateway and covered entrance rests on a retaining wall/storage unit that is necessary given the steep terrain. The interior sequence from the entrance to the main room retains the simplicity with an open structure minus any apparent structure; an abundance of openings with respect to the solar orientation provides permanent natural light and optimal energy efficiency. 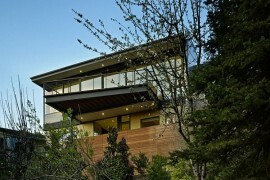 The ground floor uses natural wood for the floor and ceiling, which accentuates the beauty of the house. It accommodates four rooms and two full bathrooms arranged in a linear manner, allowing all rooms to enjoy the view. The choice of coating materials brings out the contrast between volumes. 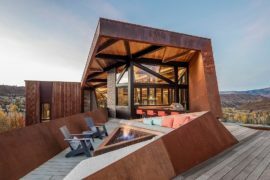 Flanked with red cedar from British Columbia on the upper volume and dyed barn wood on the lower one, the house seems to be born of the mountain and in harmony with the surrounding trees.